Born in Leicestershire and educated at Cambridge, Latimer was at first antagonistic to the Reformation in England. He was converted in his thinking under the influence of Thomas Bilney, one of the leaders of a group of reformed theologians who met for discussion at the well-known White Horse Tavern. 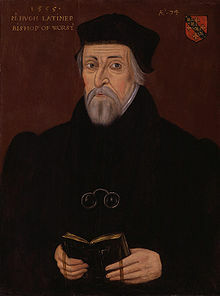 Latimer quickly became one of the leading spokesmen for the Reformation. Latimer was chaplain to King Henry VIII and, in 1535, was made Bishop of Worcester. However, his reformed views led to charges of heresy, and he endured two brief imprisonments during times when Henry reacted against reform. This entry was posted in Christian Martyr. Bookmark the permalink.